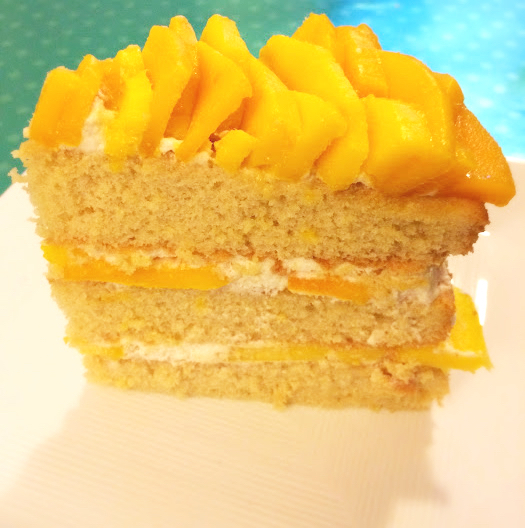 A few days prior, I was treated to an Asian style mango cake. Soft vanilla sponge with whipped cream filling and sliced mangoes on top. Light, airy, typical Asian style. But somehow not enough of a 'kick' for me. I leaned toward the rich and flavorful side. So with this challenge, I embarked on my own mango cake. I got two types of mangoes for this one. Mexican and Filipino. 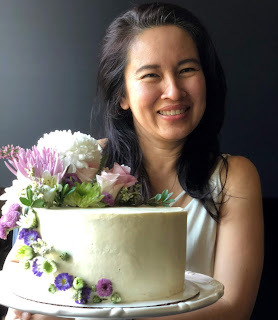 And upon closer inspection and manipulation, decided that the larger Mexican ones were more sturdy when sliced thinly, hence went on top of the cake to sculpt the rose. The Filipino ones were smaller and more tasty, and they graced the whipped cream filling between the vanilla layers. No, there will be no recipe for this post because you can find the cake recipe here and make the whipped cream filling by simply whipping 2 cups of heavy cream with 4 tbsp of sugar. Of course I spiked it! Grand Marnier works best with this tropical theme, and I used 2 tbsp of that. Layer, frost, place mango and repeat ... twice. Arrange the sliced mangoes on top as best you can and done! You can make an apricot jam glaze to set the mango slices, but I didn't. Take plenty of pictures, then blog, tweet and post. Then sit back, feet up, grab yourself a slice and enjoy. Repeat on the next birthday. Which is 3 days from now. LOL! Can i have this beaituful picture? May I know what you are going to use it for? I would be okay with it as long as you link the picture back to the blog post. Let me know before you use it please. It is for this shirt desing i am working on.